RVnGO is America's best marketplace to find RVs to rent in Mississippi. Find your RVnGO! Just north of Jackson, you can travel back in time, 36 million years ago to witness the natural beauty of the earth. For a fun day trip in Flora, guests can explore six blocks along a nature trail, picnic in the park, peruse the earth museum, gander at the mineral and Native Wild Life Display and hunt for gems while fluming at the Mississippi Petrified Forest. Good news, Fido is also welcome along the trails, as long as he is leashed. There is also a campground for your Mississippi RV Rental with showers, restrooms, 11 full hookups with water, sewer, electric and dump station. Mississippi summers can leave one wilting on the vine, perk up at one of the country's greatest water stops, the Geyser Falls Waterpark. Stay outdoors in your RV trailer rental in one of the close-by RV campgrounds, and spend the day riding the waterslides, bodysurfing in the wave pool, casually drifting on the clear waters of Round About River, sunbathing on the eight acres of white sand beaches or watching your kids play in the Lilâ€™ Squirts Hollow. Make a point to check the schedule before you suit up; the center is shut for a portion of the season. A Mecca for Muddy Waters fans, the Delta Blues Museum in Clarksdale is a treasure trove of Mississippi music. With displays featuring the greats like Ike Turner, William Ferris, and Big Brock, guests can immerse themselves in the tunes and history of the South. This gallery is open year-round and is make for a great day trip. Stop your Mississippi RV rental for a spell at the nearby Devil's Crossroads monument on your way out of town, just don't go making any deals. Just a couple of minutes from the city of Jackson, Wendy Oaks RV Resort is a choice spot to dock for a RV rental in Jackson, Mississippi. It is settled in a tranquil and serene region where you can appreciate quality time with your friends or family. It has 32 accessible full hookup spots with tables, fire rings, and space for slideouts for your camper rental in Mississippi. Services include wi-fi web access, water activities, nature trails, laundry rooms, fishing supplies, restrooms and showers, RV supplies, and self-serve RV wash. Wendy Oaks RV Resort welcomes is open for travelers all year. 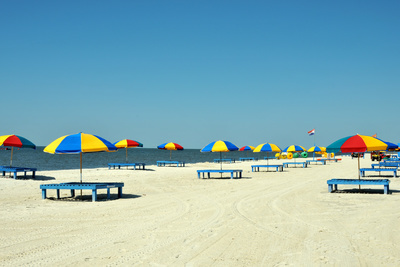 Perfect for RVers going in their RV rentals in Mississippi to the Gulf Coast, Bay Hide Away RV Park and Campground is near various attractions that can be found in the Gulfport-Biloxi Metro Area. It is the ideal escape any time of the year. It has 40 accessible full hookup spots with tables, fire rings, and space for slideouts for your RV trailer rental in Mississippi. Services and amenities include a swimming pool, play area, horseshoes, fishing, nature trails, recreational center, outside games, arranged activities, laundry rooms, restroom and showers, and self-serve RV wash. Appreciate genuine Southern charm at the Bay Hide Away RV Park and Campground. A weeklong celebration held in the downtown area of Tunica from mid to late April, the Rivergate Festival is a family-friendly occasion, which exhibits Southern hospitality. It includes approximately 30 unique groups competing in a BBQ rivalry, live singing exhibitions by famous Nashville artists, fun activities for children, merchant corners, and loads of crayfish dishes! Race your RV rental in Mississippi to Tupelo and hit up the Tupelo Elvis Festival. Held each June, the celebration pays tribute to Tupelo's own, Elvis Presley. A preliminary Tribute Artist Contest round is held to find the Ultimate Elvis impersonator. Additionally, it includes worldwide, national and local talents, a Sunday Gospel Concert, a pet parade, 5Krun, talent show, mini golf, a motion picture display, and much more. Move and sing like the "King of Rock and Roll" at the Tupelo Elvis Festival! Whether you're an Elvis Presley fan, Blues aficionado, crayfish foodie, nature enthusiast, or just somebody who wants to enjoy an awesome vacation, we know that the state of Mississippi has something for you to appreciate. Lease a RV to Mississippi at RVnGO and be rocked by its various attractions!